Although I love the flavor of blackberries, I often find even the ripest a touch too sour for my palate and spend ages after eating them picking minuscule seeds out of my teeth. 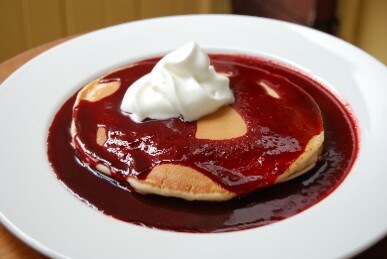 I developed this recipe to harness the very essence of the fruit, producing what I refer to as “blackberry elixir.” This sodium free sauce can be used in place of syrup on pancakes, stirred into ice cream or yogurt, drizzled over grilled meat and so much more. Place berries into a large pot, add sugar and water and stir to combine. Bring to a boil over medium heat. Reduce heat to medium-low and continue cooking about 30 minutes, stirring frequently. Once berries have softened completely, remove from heat. Ladle contents into a very fine mesh sieve placed over a mixing bowl and press with a spoon to extract as much of the liquid as possible. Store sauce in an airtight container and refrigerate until serving. This entry was posted in Sauces. Bookmark the permalink.